Our phones have a lot of great features which now allow us to use them as a multifunctional device such as a sat nav or speakerphone for taking calls in the car. But with the new laws in place, it is imperative that your phone is mounted correctly with a proper device on your dashboard, rather than being kept in the well of your car. A car phone mount is designed to hold your device in the optimum position for safe viewing of the screen while driving. They often attach onto your air conditioning vent, or have a rubber suction pad for attaching to the windscreen. A clip-on mount will be easy to take on and off and blends in with your dashboard quite well whereas a suction pad might annoy those who don’t like getting marks on their windscreen, or who don’t like the idea of leaving a mount visible when their car is unattended. When purchasing a car phone holder, don’t just go for the cheapest option as these can often be flimsy and insecure which could end up damaging your phone. You may also find some cheap universal phone holders don’t quite fit the shape and size of your phone, which can make it tricky to set up to begin with. We’ve picked out some of the best car phone holders that make using your phone in the car safe and legal. Some are compatible with charging cables for keeping your phone powered up on the go, and some allow you to change the orientation of your phone depending on your preference. Most of the phone mounts we’ve chosen are compatible with all smartphones, and they aren’t all that expensive, either. There’s a reason cab drivers tend to use vent mounts rather than the sucky ones that stick to the windscreen: they put the phone in a position where it’s easy to see without obstructing your view and they’re much less likely to come loose when you’re cornering and send your phone crashing into the footwell. Belkin is well renowned for its accessories and the Belkin Car Vent Mount is our pick for the best car phone holder right now. It simply slips onto one of your heater vents (remember to turn the airflow to that vent off if your car heating is running) and then holds your phone securely in its rubberised grips. The vent mount rotates 180 degrees so you can use your phone in portrait or landscape mode and there’s cable holder on the back to help keep the charging cable neatly connected. Speaking of cables, this mount doesn’t come with one, so if you haven’t got a spare one lying about you’ll need to buy one separately. Belkin says the mount will hold phones that are up to 5.5" and that it will accommodate most cases up to 3mm thick. How about a mount which holds your phone and charges it? This sleek option from Kenu is just the ticket, with 10W Qi wireless charging built in, saving you from having to mess around with unsightly cables. It's a really neat option, that will leave your car's cabin looking tidier. It clamps onto an air vent (a window mount is also available) and can be adjusted with a swivel joint. A dual QuickCharge 3.0 adapter is also included in the box, so you'll be able to charge a second device as well. This car phone mount isn’t anything special in terms of the cradle itself, but what this phone mount does do is allow for total hands free control. The corresponding app allows you to control your phone completely via voice control and it is even compatible with Alexa so she can play you music, make calls, send texts and route your GPS for you. There is no adjustment features on this mount, but the air vent clip is sturdy and allows your phone to be at the perfect angle for viewing. This extra-long car phone mount is perfect for getting your phone in the prime position for viewing without obstructing your view of the road. The doubled-up suction pad means it sticks to the windscreen with ease, however its length means it does tend to wobble a little on uneven surfaces. You’ll also get 360 degree ball adjustment which will allow you to find the perfect position and orientation of your screen, holding any smartphone up to 6 inches. Overall, users found this to be a simple yet effective car phone mount. If you don’t want something too fiddly and cumbersome, then this simple magnetic air vent mount is the ideal choice. Users love how sturdy the clip to the vent is, and how you can simply place your phone in any position you like on the mount. This little device may not look like much, but it can even hold your tablet and is said to stay put even when driving on uneven terrain. You do have to stick a magnetic sticker to the back of your phone in order for it to work, which can be a little unsightly if you have a pretty cover or coloured case. However, for a cheap yet reliable car phone mount, you can expect good things from this one. If sticking a car phone mount of your windscreen is a little bit of a stretch, then this sticky pad is a great option for attaching your phone to your dashboard. Buyers found this car phone mount to be very adjustable, allowing you to position your phone either horizontally or vertically, and found it to be surprisingly sturdy even for larger handsets. Some had trouble initially sticking this mount to their dashboard, but found a little bit of water helps it grip nicely. Overall customers recommend this product as sturdy and customisable mount for all smartphone devices. 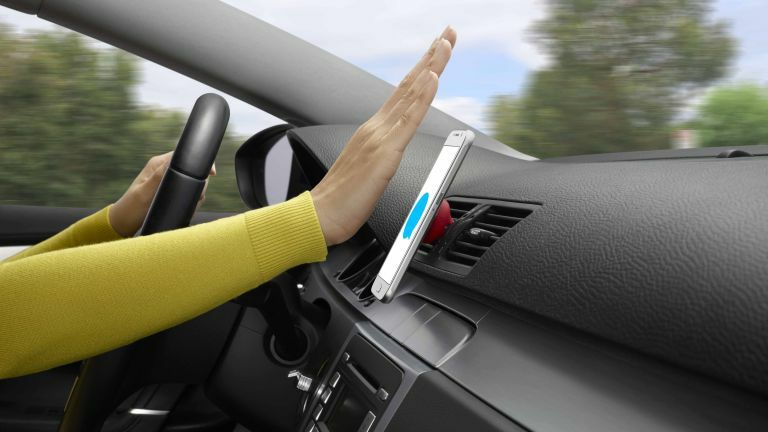 Here we have another great magnetic car phone mount, but this time you can hide the magnetic disc underneath your phone’s case discreetly so it won’t ruin the aesthetics of your phone. Owners found this small mount to hold even larger phones very well, but some had trouble with the sticky pad staying put on their dashboard. However, those with a standard smartphone can expect this mount to provide a great deal of flexibility with minimal effort. If you’re not convinced by the sticky pads or suction clips, then this car phone mount is a sturdy and solid alternative. This device is secured by being inserted into your CD slot which minimises movement and eliminates the risk of slippage. It is fully adjustable via swivel and tilt, although users with bigger screens have said that in a portrait position it can obstruct their view. You can also still play CDs with this phone mount in place, but you will have to remove it in order to change CDs.